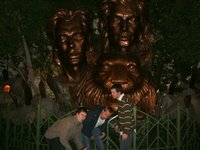 We took a lot of pictures on the way back, beginning with the Siegfried, Roy, and tiger outside The MGM Mirage. 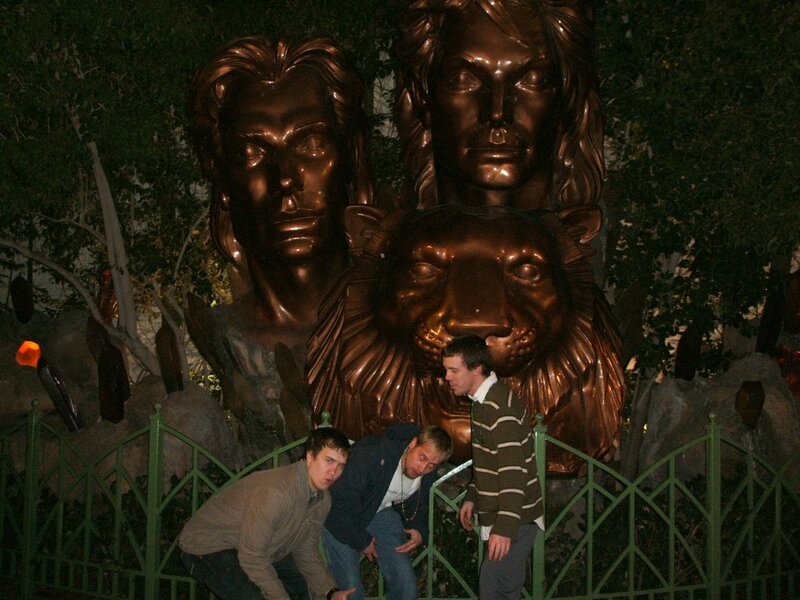 This is Jesse, Ryan, and Chris - supposedly in their b-boy stances. 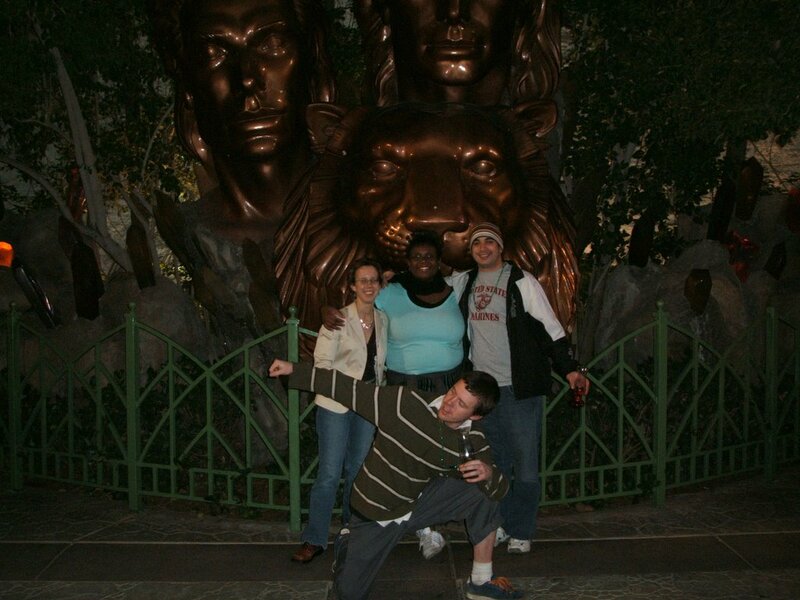 But I think I took the picture before Chris knew what he was supposed to be doing. And here's a little known fact; Chris is very photogenic. He just loves the camera. There he is with Cassie, me, and Mlb. 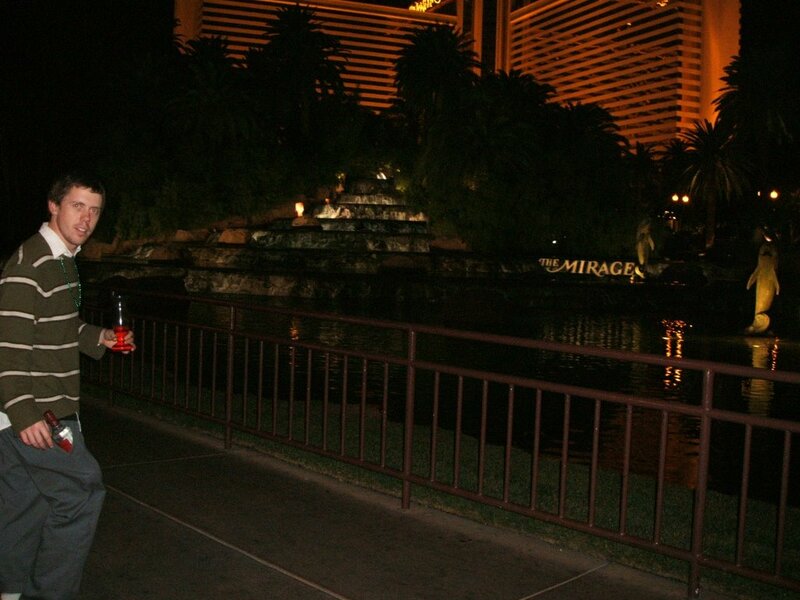 Friday night / Saturday morning was the first time I walked in front of the MGM Mirage Fountain. It's quite nice. Not as nice as the canals at the Venetian, but nice. We also ran into Chris' dance partner. Ryan re-challenged him on Chris' behalf, but the dude walked away really, really quickly. Maybe he was intimidated. I thought the walk was quicker on the way back, probably because we didn't make as many stops. We were headed to back Fatburger for me and Cassie (we skipped the first time) and then to New York New York because the boys wanted lasagne by the slice. Like I said, the walk was brisk. 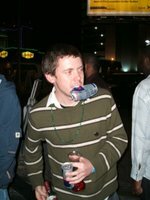 Chris needed some extra "pick me ups" and antacids in order to go on. This is a picture worth studying. Fatburger took forever and by the time we got to New York New York, the lasagne place was closed. It was also apparent that Chris was pretty drunk and needed food. 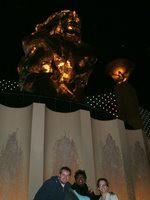 After Cassie and I (and eventually Chris) ate, we took more statue picture, this time at the MGM Grand. 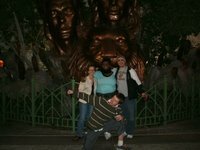 Then it was back to the Motel 6, where got really angry at Chris (after much instigation) and tried to take a cab home. Jesse wouldn't have it AND he took Chris' side (no surprise there) so I was doubly miffed. The ride home provided a little bit of a distraction but I was still heated when I got home. So I went to the gym. It was 4:45 in the a.m. When I got home, I felt better, but sleepy. And wouldn't you know it, Tab & Mike arrived around 11:30. The group was complete. We got a car wash, ate breakfast, and headed (you guessed it) to shoot automatic weapons. I'm not kidding.